Jaw 4-1/2" long , Base10" long , Width 2-3/4 "
The Bridge Compensator™ will hold a guitar bridge precisely and safely while you mill the compensation slot. Use a shim cut to the proper angle to index the bridge. The Luthier's Friend™ micro-adjustable fence will allow you to set up perfectly and the long base allows for a safe and easy feed. Chuck up an end mill in your drill press and you are set to go.The Bridge Compensator™ gives you repeatable accuracy for small production runs. Use it without the shim to drill the bridge pin holes. 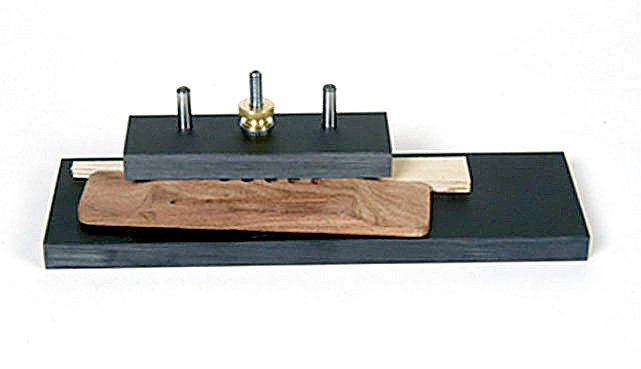 The Bridge Compensator™ turns your Luthier's Friend™ into a bridge making machine.